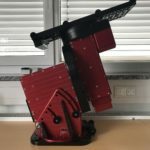 Please visit the Paramount MX+ web page of Software Bisque for details about the Paramount MX+ Robotic Telescope System. If you are interested, please send us an email to kontakt (at) baader-planetarium.com or call us. The suitable tripod for the MX+ mount in portable use is also in a complete new design, total tripod weight: 20 lb (9 kg). max. 7 arcseconds or less peak to peak periodic error before correction.